“The Zoo,” performed by the cast of Odyssey Opera. Odyssey Opera’s spring festival of British works got off to an auspicious start last week with a stellar production of Vaughan Williams’s “Sir John in Love,” a rarely spotted but substantial evening-length work by a master composer whose work has never entered the mainstream of 20th-century opera. The company’s journey of exploration continued this weekend with a double bill of one-acts sharing zoologically themed titles, if little else: Arthur Sullivan’s “The Zoo” and William Walton’s “The Bear.” Compared with “Sir John,” both scores were more modest in ambition and in impact, but they received robust performances on Friday night at the Boston University Theatre, suggesting two zesty side dishes in this ongoing banquet of little-known British opera. Just how little-known was underscored by the fact that Friday’s account of “The Zoo” was said to be its first American performance. This work’s British premiere took place in 1875, a period when Sullivan’s famed partnership with W. S. Gilbert was just taking wing, but the work’s libretto was in fact written by Bolton Rowe, a pen name of the dramatist B. C. Stephenson. It was revived in the 1870s but never published during Sullivan’s lifetime. The plot of this “musical folly in one act” revolves around the trials of two young couples in the London Zoological Gardens of the mid-19th century. As the curtain goes up, Carboy, an apothecary in a white lab coat, is trying to hang himself from the zoo’s refreshment stand as a fascinated crowd gathers to ask what on earth drove him to this unsightly fate. Carboy explains he loves Laetitia but they are being kept apart by her father, Mr. Grinder. Meanwhile Eliza, doyenne of the refreshment stand, is being pursued by Thomas, whose ambitions in love are rivaled only by his own gastrointestinal travails. Much tuneful and cleverly rhymed hilarity ensues; Thomas rouses himself and reveals he is a member of the aristocracy; Carboy seeks to end his woes in the bear pit. But “The Zoo” ending is a happy one. Couples wind up as they should be; British jollity and wit conquer all. Much of the action in Sullivan’s score is propelled by the interplay between the principals and the crowd of onlookers, here transformed by the delightfully whimsical animal-themed costumes of Amanda Mujica. 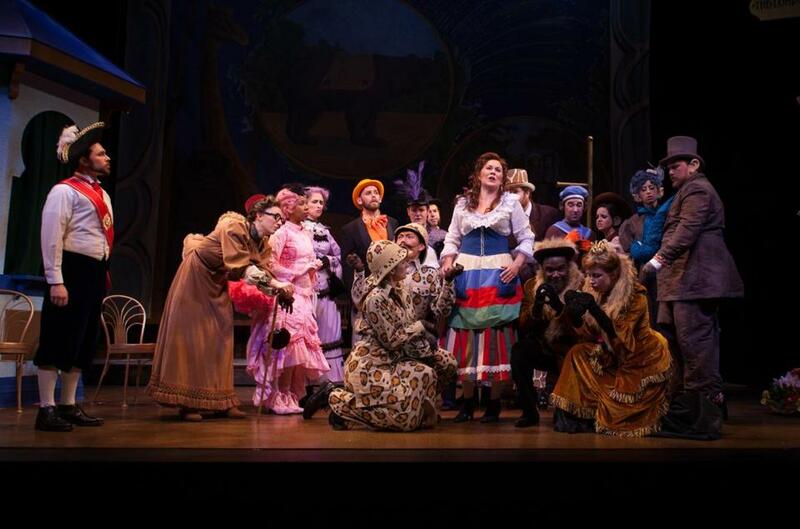 Walton’s “The Bear,” by contrast, is a tautly organized chamber opera for just three characters. Described by Walton as “an extravaganza in one act,” and based on a Chekhov farce of the same title (adapted by the composer and Paul Dehn), “The Bear” premiered at the Aldeburgh Festival in 1967. It opens with a young widow, Yelena Popova, at home with her servant Luka, mourning her unfaithful husband’s death with an exaggerated theatricality that does not seem to be fooling anyone. In strides one of her late husband’s creditors, the boorish (or better said, “bearish”) Grigory Smirnov, who will not leave until his debt is paid. Yelena refuses to cough up the money, and their ensuing standoff crescendos to a duel scene with pistols before passions guide them, to Luka’s shock, toward a very different resolution. Beatty as Laetitia, Colin Levin as Thomas, Sadie Gregg as Eliza, and Dyer once more as Mr. Grinder. Lynn Torgove, as the stage director for both one-acts, and Stephen Dobay as the scenic designer, showcased the strengths of each work to maximum effect. When mounting rarities such as these, each production “counts” in a different kind of way, since one never knows if or when these operas will be spotted again. Odyssey Opera clearly grasps this dimension of its work, and lavished evident care on both scores. That extended to the orchestral work, with “The Zoo” capably conducted by James Blachly and “The Bear” led incisively by Gil Rose. One hopes the audience itself may also be catching up with these offerings. At last week’s “Sir John” performances, the turnout was far sparser than the work deserved. Friday’s showing was a bit better. With its final two programs still ahead — a night of five monodramas, and Thomas Adès’s chamber opera “Powder Her Face” — this festival is already shaping up to be one of the young company’s most compelling projects to date.